The name Leonardo da Vinci is often associated with innovative thinking, design ideas, and artistic masterpieces. Although many know him as an artist, he wore many hats including that of a mathematician, an engineer and inventor, a scientist, and even an astronomer, to name a few. As a result of his many talents and ideas, which were far before his time, da Vinci is considered a genius and the quintessential Renaissance man. Because of his many accomplishments, he is still a figure of much inspiration some 500 years after his death. People who are not familiar with the man will find both his life and his accomplishments fascinating. Leonardo da Vinci was born in the spring of 1452, the son of an unwed young peasant and a notary. Raised by his father, who was well-respected and of a higher class than his mother, Leonardo's path toward becoming a man of many skills began by the age of 14. At that time he started as the apprentice of an artist by the name of Verrocchio who taught him a number of technical skills such as metalworking, carpentry, drawing, and leather working. He became so adept that he was accepted into the Guild of Saint Luke by the age of 20. For seventeen years, he worked for the Duke of Milan, where he worked as both a painter and an engineer. During his time with the Duke of Milan he developed an interest in optics and geometry. After the Duke was defeated and chased away by the French army in 1499, Leonardo left as well and eventually obtained work with the Borgia family in Florence as their chief architectural advisor and later the chief military engineer. It was during this time that he focused on things other than artistry, such as anatomy, mechanics, and his interest in optics and mathematics. Following his time with the Borgias, he returned to Milan and stayed at his father's estate working on science and engineering projects. In the last years of his life he was invited by the king to come to France as his head architect and painter. During that time he finished many of the works that he had already in progress. In May of 1519 at the age of 67, Leonardo da Vinci died in his home which was next to the King of France. Leonardo da Vinci (1452-1519): Click on this link for a brief overview of the life of Leonardo da Vinci. The article discusses his time as an apprentice during his youth, his notebooks, and his time working for the Duke of Milan as an artist and engineer. Leonardo da Vinci bio: This link opens up the biography page for Leonardo da Vinci on the Bio.com website. The page provides readers with quick facts on the artist and inventor's life and reviews his life and works in detail. Readers can also view a video as well. Artists Leonardo da Vinci: A Leonardo da Vinci biography on the J. Paul Getty Museum website. The biography is brief and summarizes key points regarding his life. Artist Report - Leonardo da Vinci, 1452-1519: On the page associated with this link, the life of Leonardo da Vinci. His life is divided into sections and key points are documented using a bullet-point format. The da Vinci Project: On this page readers will find a very brief biography on the life of da Vinci. Readers will also find information on his life as a scientist, inventor, and artist, and a review of some of his manuscripts and drawings. Leonardo's Life: This link opens up a page that provides a quick summary of Leonardo da Vinci's life. It also briefly reviews his interest in invention. Brief Summary of Leonardo da Vinci: Click this link for an abbreviated summary of the life of Leonardo da Vinci. Giants of the Renaissance - Leonardo da Vinci: On this page readers are given a brief history on the life of da Vinci. The page also features illustrations of some of his inventions. Timeline: Leonardo da Vinci: This page converts Leonardo da Vinci's life into a time-line. The Life of Leonardo da Vinci (1452-1519): This Fordham University article features a brief overview of Leonardo da Vinci's life, his inventions, and his artwork. As an engineer and a scientist, da Vinci was interested in creating ways to improve life and improve upon the current methods of doing things. He kept several notebooks that he filled with concepts, drawings, equations, and figures. These were his inventions, some of which became a reality during his lifetime, and others that did not become a reality until after his death or not at all. His inventions and designs included bridges, ladders, parachutes, and even shoes that walked on water. He had a great interest in flying machines as well. His flying machines, although unsuccessful, included a glider, plans for a helicopter, an ornithopter, and a parachute. In addition to these types of inventions, he also created designs primarily for the Duke of Milan for weapons of war. These weapons included mortar bombs, cross-bows, catapults, multi-barreled guns, and military tanks. Leonardo da Vinci: The Engineer: This article discusses Leonardo Da Vinci's work as an inventor. It discusses his bridge designs and his flywheel and crank engine designs. Leonardo da Vinci - His Life and Career: This article gives a run-down of da Vinci's life and works. It includes a list of his inventions. Leonardo's Inventions: On this page readers are given a few examples of Leonardo da Vinci's inventions. The inventor's habit of not completing inventions is also discussed. Best Inventors - Leonardo da Vinci: This Time magazine article named Leonardo da Vinci as one of the best inventors of all time. It gives a very small list of his inventions. Da Vinci's Inventions: Click this link to view a slide-show of inventions that were created by Leonardo da Vinci. Each slide has a brief description. Da Vinci Inventions: Inspired Engineering: Readers who click this link are able to view a slide-show on the CNN website that lists the author and inventor's inventions. The Inventions of Leonardo da Vinci: This link takes the reader to the museum page on the Hamden College website. The page discusses inventions by Leonardo da Vinci in relation to an exhibit. The article reviews how the drawings of his inventions are similar to modern technology. 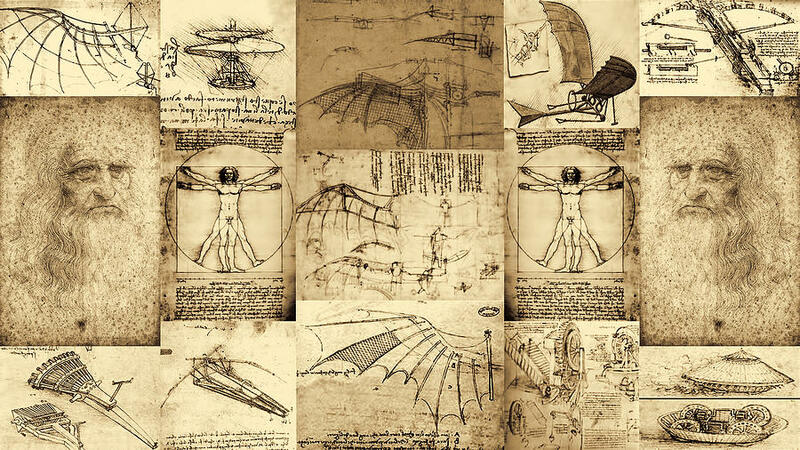 Speculative da Vinci Condotta: Click on this link to learn about some of da Vinci's inventions for war and his flying machines. The article reviews his time in Milan. Leonardo da Vinci Quintessential Engineer: This link takes the reader to an article that discusses da Vinci's work as an engineer. His contributions in terms of warfare, hydraulics and flying machines are reviewed. As a painter, Leonardo da Vinci's work is recognized around the world. His first painting was the Baptism of Christ, which he did in 1476 alongside his mentor, Verrocchio. In 1481 he began working on the Adoration of the Magi, however, he left this work incomplete. During his time with the Duke of Milan, Leonardo began painting one of his two most famous works, The Last Supper. In addition to The Last Supper he also began work on The Madonna of the Rocks, or the Virgin of the Rocks, during this time. The second of his most famous pieces is the Mona Lisa. This was a privately commissioned piece that he began work on upon his return to Florence and completed sometime between 1505 and 1507. Although it was a commissioned work, da Vinci never delivered it and kept it in his own collection. The Mona Lisa is arguably one of the most recognizable pieces of art in the world, and the object of much curiosity regarding the subject. In 1508 he painted an oil on wood painting called The Virgin and the Child, which depicted St. Anne, the Virgin Mary, and the infant Jesus. During the final years of his life with the king, da Vinci was able to complete many of his unfinished works before his death. Leonardo da Vinci - Art: On this page readers will find quick facts about da Vinci as well as information regarding some of his works. The article reviews The Mona Lisa, The Last Supper, and Virgin of the Rocks. Leonardo da Vinci Painting: Mona Lisa, also called La Giaconda: Click this link to open up a PDF document that provides information about the painting The Mona Lisa. The document also briefly discusses the artist's personal life and his style. The Spirit of Florence - Leonardo Da Vinci: Read this article to learn more about the life and works of da Vinci. The works discussed in the article include his artistic work as well as his inventions. Leonardo da Vinci Artwork: On this page readers will find six of Leonardo da Vinci's paintings. Beneath the paintings there is a two-sentence description of the artist and his impact on Italian art. 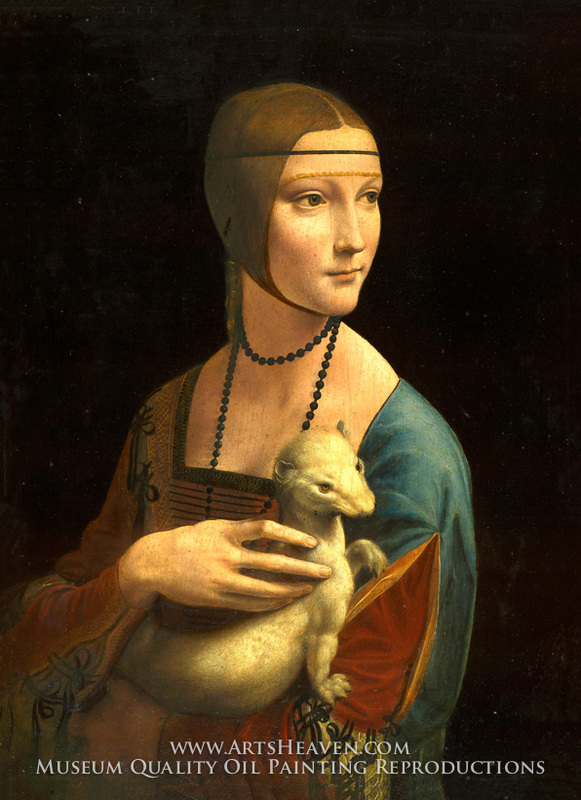 Stoat- Lady with Ermine: Click on this link to see an image of Leonardo da Vinci's Lady with Ermine painting. The page provides information on the painting as well. 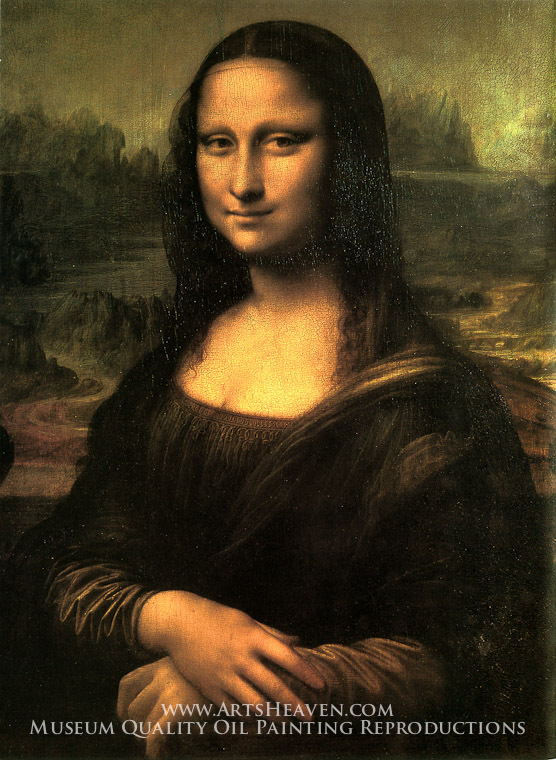 Leonardo da Vinci 1503-1505 Mona Lisa: This article briefly discusses the Mona Lisa. The page also reviews some of the mystery associated with the painting. The Accidental Masterpiece: Leonardo and "The Last Supper": Click this link to open up a window that contains an audio concerning The Last Supper. Famous Artists - Leonardo da Vinci: This Thinkquest Library article lists four of Leonardo da Vinci's most famous works. It also provides a small amount of background information. Virgin of the Rocks: This article appears on the BBC website. It gives a short history of the painting Virgin of the Rocks and reviews the controversy that is associated with it. The Classic Italian Renaissance - The 16th Century Leonardo da Vinci: On this page readers will learn about da Vinci's techniques in drawing and painting. Images of his drawings from his notebook are included, as are some of the images from his paintings. Da Vinci's Code: This web page by art history professor Christopher Witcombe features a gallery of da Vinci's artwork, as well as his engineering drawings, maps, anatomical studies, and more.